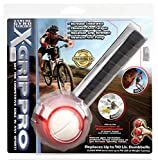 82 features: -hand exerciser. -Gyro aids in the rehabilitation injuries to fingers, hands, wrists, forearms, elbows, biceps and shoulders. 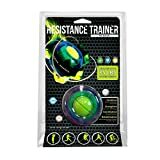 -Resistance to increase grip strength, increase range of motion, and to condition arm, and shoulder muscles. -Training cd. Product type: -forearm exercisers. Dimensions: overall height - top to bottom: -2.5 inches. Overall width - side to side: -2.5 inches. Overall depth - front to back: -7.5 inches. Overall product weight: -.75 pounds. With a push of the button the new power dock Docking Station activates the gyroscopic Amber power ball! as speeds build resistances grows, this Powerhouse reaches up to 13, RPM with 35lbs of gyroscopic force. This 12080 combines our top of the line gyro, the Amber power ball with the amazing Docking Station. Single sizes for left or right hand. The Original Dyna-Flex Pro is entry level gyro that everyone is talking about. The rotor, which can reach speeds of up to 9,000, rpm and puts out 35lbs. of torque, features a new "thermo band", which aids the user in controlling this powerhouse. 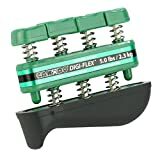 The Dyna-Flex Pro a newly designed fun and almost addicting new product that is not only can be used as an executive relaxer, a carpal-tunnel/arthritis reliever, or a strength and coordination builder, but will knock your socks off! Wherever tasks necessitate repetitive wrist motions that includes flexion, extension and rotation or if you suffer from carpal tunnel syndrome or repetitive motion trauma then, the Dyna-Flex is a product that you should be using or at least trying out once. We challenge you to take hold of the Dynaflex Pro when it's moving at 9,000 rpm's. Discover the revolutionary way to build up strength in your hands, wrists and forearms. 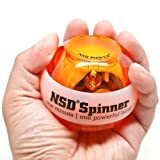 The NSD Power Spinner is a gyroscopic exerciser that gives you a great workout even away from the gym. It’s small and compact, so you can take it anywhere. Simply pull the string to get it started, and this amazing device will give you up to 25.9 lb.-in. of torque at 10,000 RPM. The angular momentum that builds up through a spinning mass provides the resistance, and you’ll be surprised at how much work it takes to keep it spinning. A few minutes a day is equivalent to hours of work with a dumbbell. 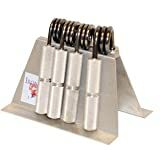 The Spinner exerciser is great for amateur or professional athletes in any sport that involves the hands and arms. It will help you build up strength, power and control. It’s also a lot of fun.In addition to sports training, it’s also great for preventing repetitive strain injury that can occur from spending too many hours at the computer. Keep the Spinner by your desk at work to use during breaks! The Spinner is vigorously tested by NSD to extremely high quality standards. Not just a simple, good-looking way to protect and store your trusty Captains of Crush Grippers, the CoC Caddy is also a helpful training aid: keep your CoC Grippers in order, making it easy and efficient as you work through your warm-up sets and your work sets, and wrap up with your challenge gripper or maybe a couple of negatives. Sporting a clean, functional design, the brushed aluminum caddy holds 10 grippers in order and ready for action. Not just a simple, good-looking way to protect and store your trusty Captains of Crush Grippers, the CoC Caddy is also a helpful training aid: keep your CoC Grippers in order, making it easy and efficient as you work through your warm-up sets and your work sets, and wrap up with your challenge gripper or maybe a couple of negatives. Sporting a clean, functional design, the brushed aluminum caddy holds 5 grippers in order and ready for action. The CanDo Digi-Flex develops isolated finger strength, flexibility and coordination as it builds hand and forearm strength. Use each button independently to exercise fingers or compress the entire unit for complete hand and forearm strengthening. Comes with illustrated manual. Develops isolated finger strength, flexibility, and coordination. Stronger fingers cannot compensate for weaker ones. Progressive color-coded resistance gives patient positive feedback. Also builds hand and forearm strength.